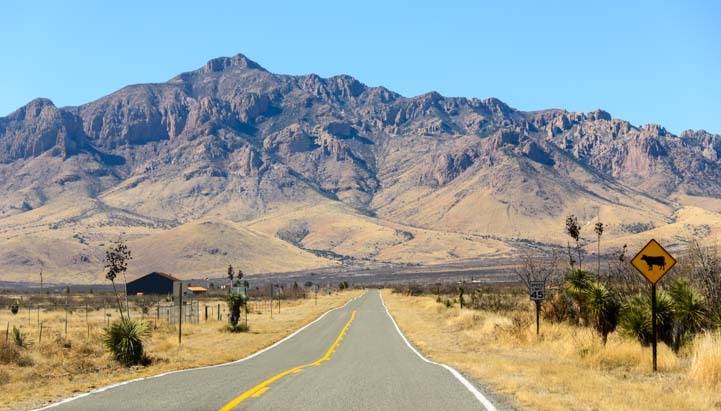 February, 2015 – The Chiricahua Mountains are a big mountain range that rises up from southeastern Arizona’s desert floor. They are one of many “Sky Islands” in the area that are filled with high altitude flora and fauna. You can get to them from both the west, in Arizona, and the east, via New Mexico. 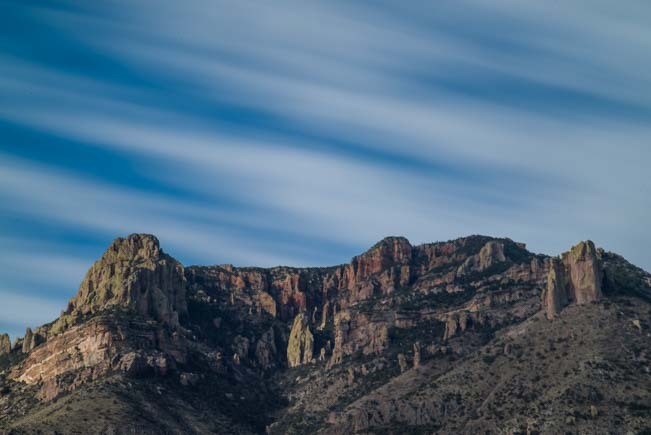 The west side is home to Chiricahua National Monument, a fabulous area full of exotic rock hoodoos and hikes that climb straight up to grand views and plunge straight down to cool caverns among the roots of very tall trees. The east side is an extremely popular birding area, and birders from around the world walk the forest roads and prowl through the thick vegetation in search of unusual species. We have been to both sides, but on this trip we came in from the east. What a dramatic view greeted us as we turned onto Portal Road and began to drive towards the mountain range. The beautiful Visitors Center building. 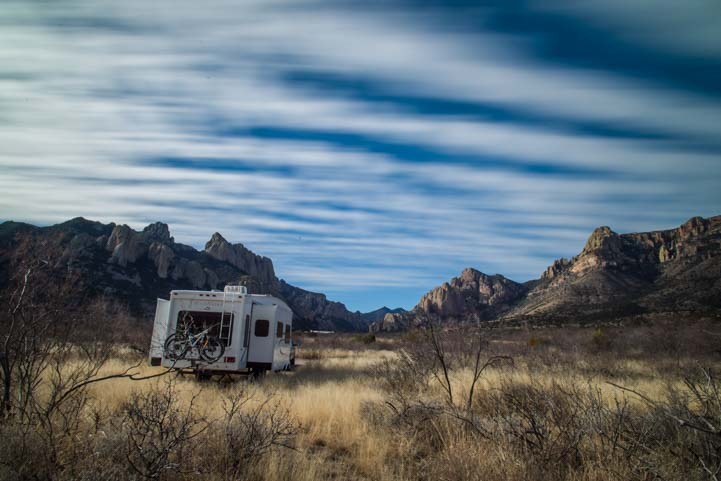 The Chiricahuas hold a special place in our hearts, because we enjoyed many camping trips here with our popup tent trailer a decade or so ago, before we started RVing full-time. 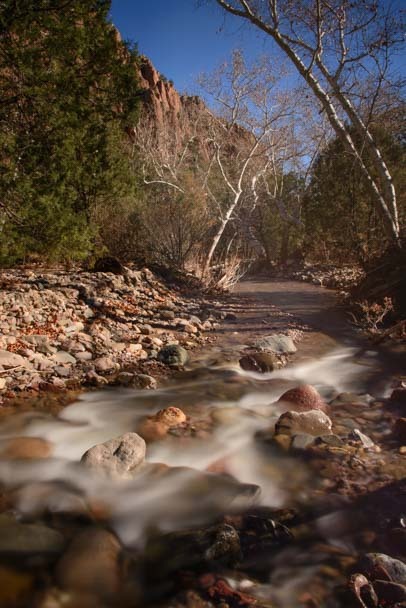 Cave Creek is at the heart of the Chiricahuas on the eastern side. 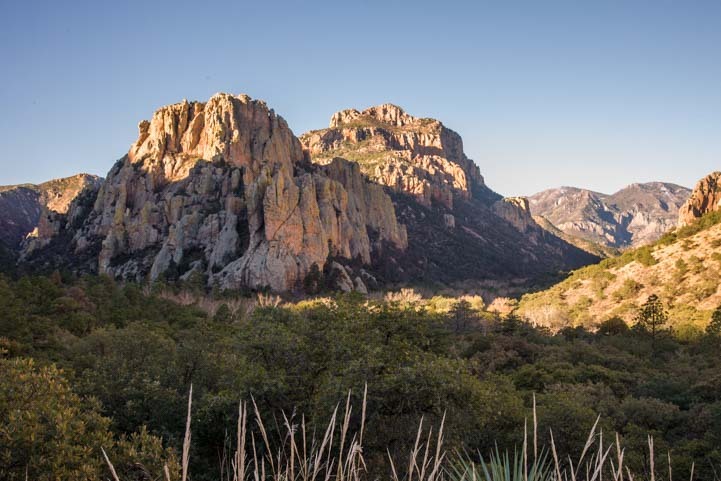 Every time we visited the eastern Chiricahuas in those days, the area was absolutely teeming with campers, hikers, scientists and birders. 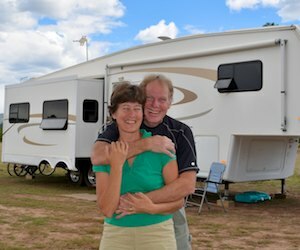 The region is very woodsy, and several absolutely charming little campgrounds are tucked between babbling Cave Creek and the soaring, sheer faces of towering cliffs. 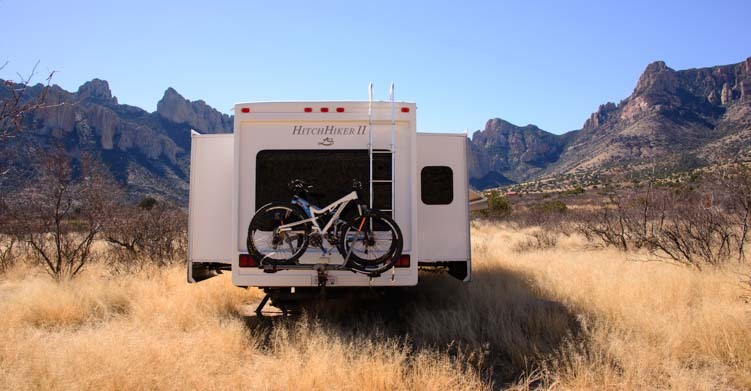 We had been looking forward to a return trip to the Chiricahuas for a long time. When we used to drive the one road that leads into the heart of these mountains, we could always spot little trailers and tents between the trees, and we could always hear the voices of people camping and enjoying the area. Sunny Flat was our favorite campground, and even though our current RV would never fit into a site there, we were looking forward to taking a memory-filled stroll around the picturesque campground loop. …the rock formations are majestic and striking. 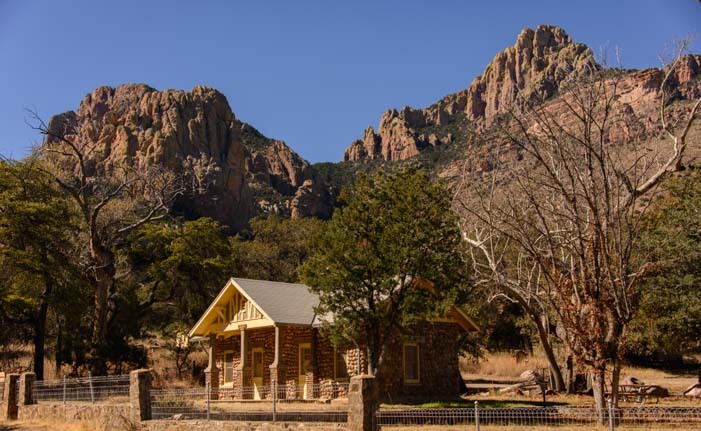 What a surprise it was to stop in at the only store in the tiny village of Portal, Arizona, on the edge of this magical woodland, and discover that all the campgrounds on the eastern side of the Chiricahuas were closed. We were told it was because of the recent floods. It had rained a lot a few days ago…had that caused huge flooding? The storekeeper was a little unclear. 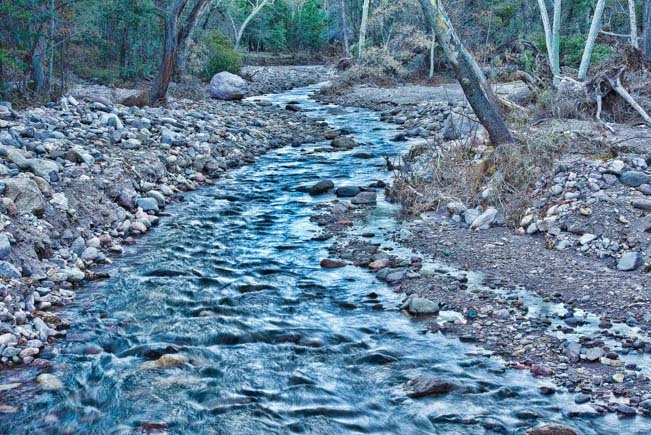 But when we drove in, we found the woods were deathly silent and the road over the stream to our beloved little campground had been gated since November, 2014. The sign made it clear that it was illegal even to set foot on the other side of the fence! The road into Sunny Flat campground is closed. What a shame! We drove up and down this once beautiful road, and there wasn’t a soul to be seen. The campers were gone, the hiking trails and forest roads were all closed, and there wasn’t a birder to be found. Most shocking for us to learn us, however, as we were stopping at viewpoints and clambering over wobbly river rocks towards the little stream, was that the very tame looking Cave Creek had become a raging ocean of currents last September, and had cut a wide swath into the woods on both sides. Downed trees were everywhere, and the more we walked along the river banks, picking our way between the uneven rocks, the more we realized the size and scale of the devastation. We found (and created) beauty in spots between the destruction. Bulldozers had piled rocks high in places, and they had dumped loads of trees and root balls in various spots too. The whole place was a total mess. There was still beauty here and there, and we enjoyed many hours of photography on the riverbanks, but the mood was somber, and we didn’t hear any birds. Cathedral Vista is a stunning overlook and easy hike. Fortunately, the dramatic rock formations are unscathed, and Cathedral Vista was as magnificent as ever. We climbed up to enjoy that overlook several times! The origin of all this devastation was a 350 square mile forest fire back in 2011. 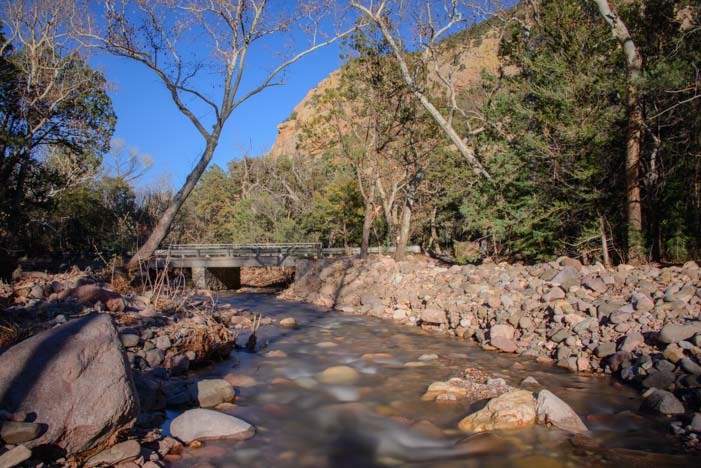 The loss of all that living vegetation destabilized the hillsides, and big rains this past October (2014) swelled Cave Creek beyond recognition. The rushing water in the river and torrential rainfall on the mountainsides caused massive erosion, toppling trees and cutting huge gouges in the riverbanks. 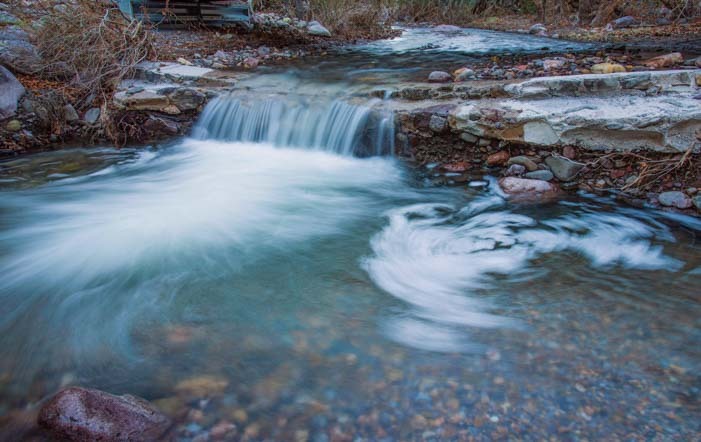 Who would guess this glittering brook could be so violent! We were told that water covered the campgrounds completely, rising to knee height in the bathrooms and nearly sweeping them away. 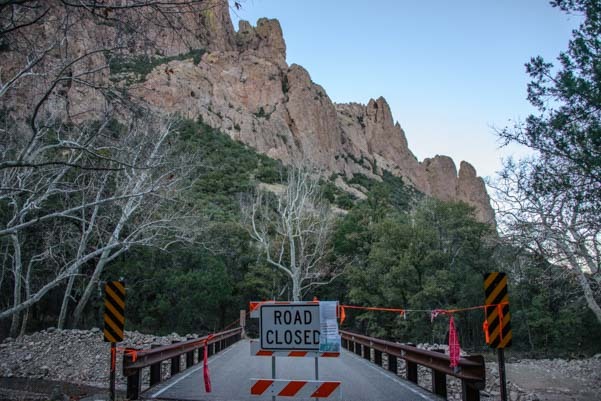 It’s not clear when the forest roads, hiking trails or campgrounds will reopen. A candy-striped sunset filled the sky one evening. 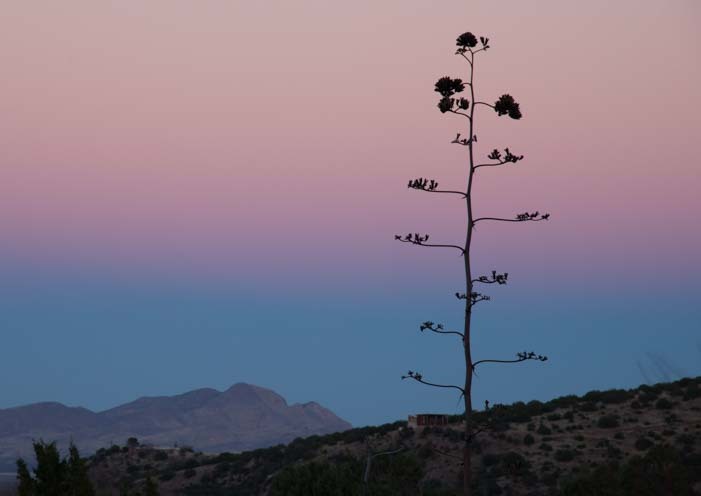 The eastern Chiricahuas are still a beautiful place, even if they are not as vibrant and alive as they once were. The sky took on pastel hues at sunset, and at one point I found myself standing right next to a deer on the totally vacant main road (blog post here). 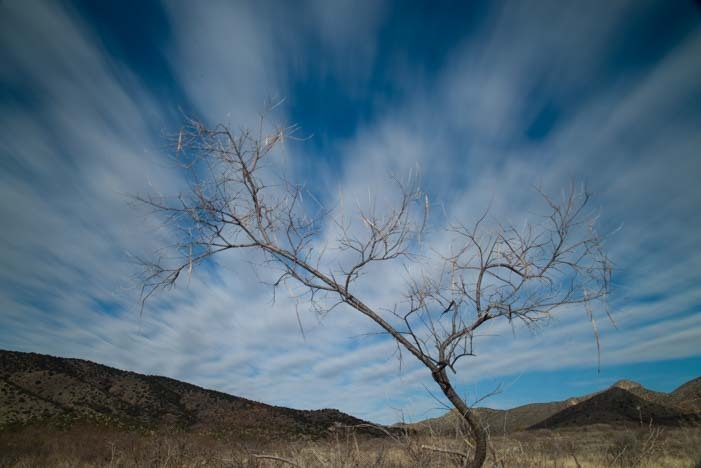 Mark took some fantastic photos of a blue and white striped sky one morning, and we reveled in an incredible quiet that wouldn’t have been here otherwise. The heavens were striped white and blue one morning. 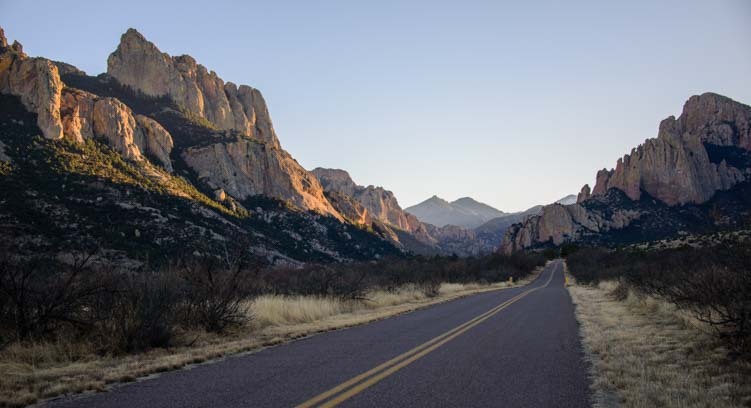 If you are planning an RV trip to the Chiricahuas, the western side and the National Monument are still open. Friends who were just there tell us the hikes among the hoodoos are as exhilarating as we remember. The eastern side still needs time to recover, however, although we still enjoyed our brief visit very much. 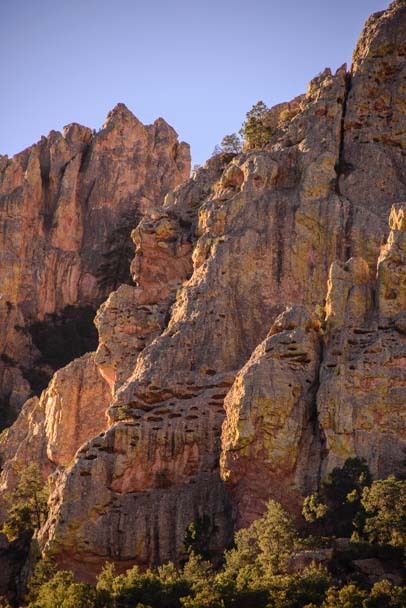 We see a stunning view over our shoulders as we leave the Chiricahuas behind us. 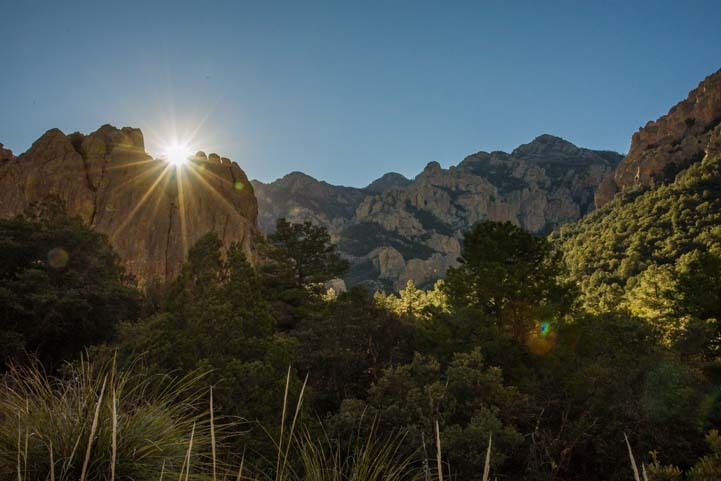 Chiricahua Mountains – US Forest Service site for both the western (National Monument) and eastern (Cave Creek) sides. 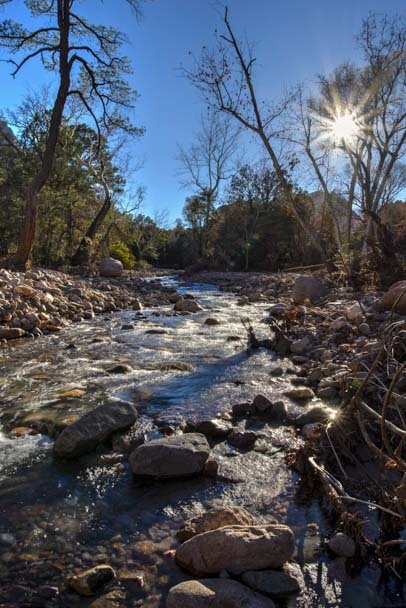 we are thinking about heading that way and thanks for the heads up as I hadn’t heard about the flooding and I had so looked forwarding to hiking along cave creek once again… can you still hike along the creek or is all of it closed off? We have not been to the eastern side of the Chiracahuas. Thanks for sharing this post. Even with the destruction all around, you still captured the essence of the area with your stunning images.